When Roxana Silva speaks of corruption in her home country of Ecuador, her passion is palpable. She tells of government officials absconding with public funds and the uneven application of law. She describes, for example, a community of indigenous farmers struggling against poverty while, for 10 years, completion of an irrigation channel they needed for their crops was delayed by official mismanagement and indifference. As she discusses her efforts to promote public accountability and civic engagement in a country with a poverty rate hovering near 40 percent, she leans forward, searching for exactly the right words. Apologizing—unnecessarily—for her English, she talks about the critical need to empower people at all levels to speak out and serve as monitors against corruption in Ecuadorean public life. Silva hopes to develop new tools for achieving that goal during a 10-month residency at the Maxwell School, where she and 10 other international professionals are pursuing non-degree study and professional development as the school’s first cohort of Hubert H. Humphrey Fellows. Syracuse University is one of just 17 universities nationwide selected to serve as host schools for Humphrey Fellows and one of three focusing specifically on public administration and public affairs. 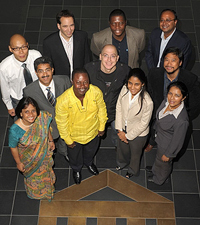 The Humphrey Fellows program, created in 1978 by the Carter Administration, supports leadership development and networking opportunities for individuals from around the world who have shown a commitment to public service. The Humphrey Fellows Program will reside at Maxwell at least four years, says Lane. It is among the latest in a series of programs and opportunities that have brought international students, professors and professionals to Maxwell to further their own development while serving the cause of international understanding. The school’s ability to attract the Humphrey program—funded by the U.S. State Department as a Fulbright Exchange—speaks to its longstanding success with such programs, says William Sullivan, assistant dean and a past director of executive education. Maxwell has been especially successful, he says, in attracting State Department-funded activities. In addition to Silva, the SU cohort—among an estimated 160 fellows selected annually—includes public service professionals from Sierra Leone, the Philippines, Israel, India, the Dominican Republic, Tunisia, the Republic of Korea, Moldova and Liberia. They arrived at Maxwell in mid-August, each with a customized plan that includes optional course work, a seminar exploring questions of leadership and democracy, community service, faculty mentoring and engagement with both local and regional or national organizations that dovetail with their professional objectives. In India, Humphrey Fellow Shouvik Mitra left an architecture career to work on developing sustainable income opportunities for moving women out of poverty. At Maxwell, he’s hoping to gain both the theoretical knowledge—in the areas of poverty dynamics, development theories and policy analysis—and the practical skills to support that effort. “This program offers much more freedom than others, since it’s a non-degree program,” he says. “There are certain things that Maxwell provides that I need—courses in public policy, statistics, quantitative analysis, evolution of international programs, developmental economics—but I’m also networking. I have a lot of support from the other fellows and also a lot of flexibility.” He’s working locally with the Central New York Community Foundation and in the spring hopes to work with the World Bank, a major funder of development projects in India. Among his other goals, Mitra hopes to find ways of expanding donorship bases and bringing more highly trained professionals—doctors and engineers, for instance—into the NGO sector. In his short time working with Syracuse-area nonprofits, he’s found Americans’ penchant for volunteerism particularly worthy of study. As a consultant who trains both citizens and public officials as part of her anti-corruption efforts in Ecuador, Silva says she applied to the program with the hope of developing new tools for promoting civic participation, human rights and engagement between citizens and public officials. She’s already picked up some ideas and inspiration from local groups like FOCUS Greater Syracuse, ProLiteracy and Syracuse Cultural Workers. She also hopes to spend some time with the Open Society Institute in New York City or a public ethics office in Washington, D.C. The diversity of Maxwell’s student body adds another, somewhat unexpected, dimension to their experience, according to several of the fellows. Nimrod Pinhas Goren, founder of an NGO promoting young people’s involvement in shaping Israeli relations with neighboring countries, finds the international mix—both among the fellows and throughout Maxwell—quite different from what he experienced as a university student in Israel.